Hi everyone! May I present? Madame Coco in all her glory. 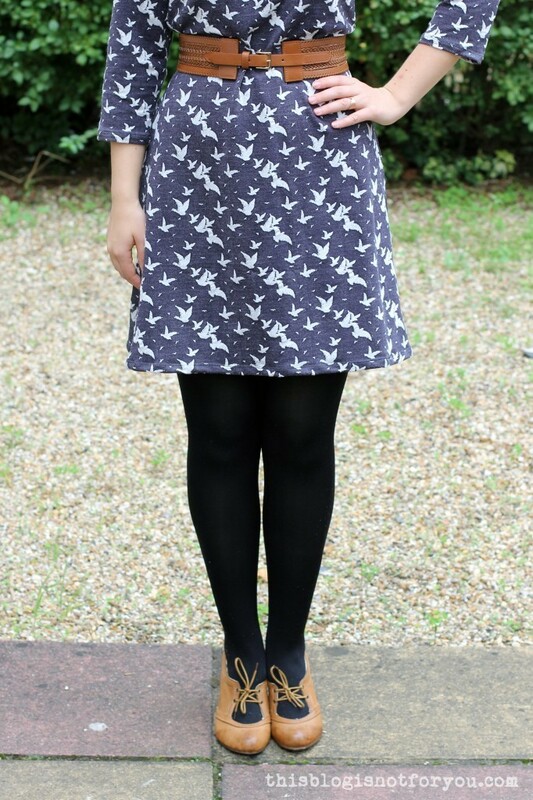 The pattern: I finally got around to use the Coco Dress pattern which I bought from the Coco lady herself, at the Makegood Festival in May. I didn’t make it earlier because I did not have the right jersey fabric at the time (I’m always short of jersey fabric). 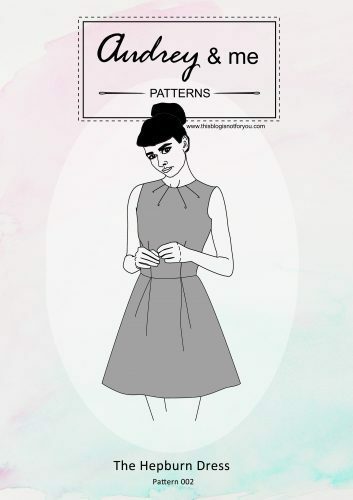 The pattern is great, pretty straight-forward and the instructions that are included are very detailed and easy to understand. The dress came together in about 3 hours, and by this I mean tracing the pattern, cutting the fabric and sewing everything together. I was a bit impressed myself, I have to say. I sewed everything with the overlocker, though. Not only because I was too lazy to change needle and thread on my sewing machine, but also because I am absolutely in love with my overlord. It’s the best investment I made this year. The fabric: I bought this soft and cuddly knit fabric on Walthamstow Market for £1.50/m. 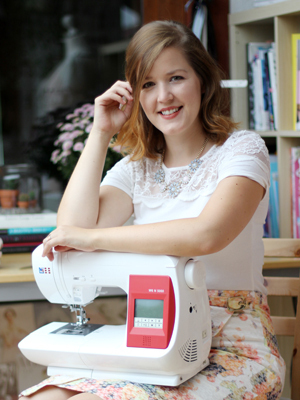 If you read and follow Dani’s blog, you might recognise the fabric as the one she used for her gorgeous Bronte Top. We actually bought the fabric together because it just looked too cosy to be true and, obviously, because it HAS BIRDS ON IT! That’s how awesome it is. I only had 1.5m and it took some measuring and squeezing until I figured out how to fit the dress pattern, the sleeve and the funnel neck on there. In the end I decided to cut out two pieces for the funnel neck, so it had two side seams now, instead of just one. 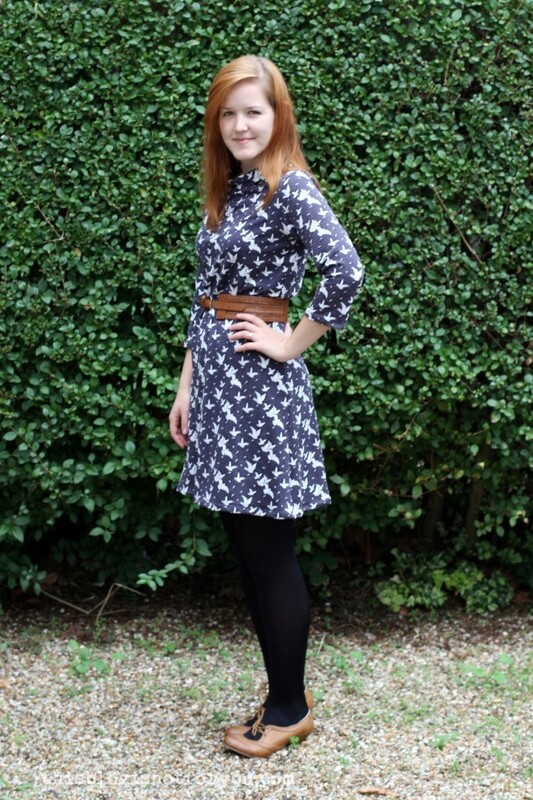 The fit: For some reason I do have fit issues with Tilly & the Button patterns, they often turn out to be too small. This time the Coco ended up being a bit on the wider side, which is probably due to my fabric choice. I chose a fabric with a lot of stretch which is probably why it is a bit too loose. Apart from that the fit is quite good. I wear the dress with a belt, though. Without a belt it looks a bit too comfy, almost like a night gown. (I’m really glad that I skipped the cuffs!) And the belt also helps to cinch in the loose waistline of the dress. I might take it in at the sides at some point. Lately, I have been sewing like a mad woman and I can’t seem to stop. I just got new patterns, new fabrics, hundreds of project ideas and a day off today. I don’t know where to start, my head is at risk of exploding. Sometimes I wish I could work on 5 projects at the same time. What have you been up to lately? Any Cocos? 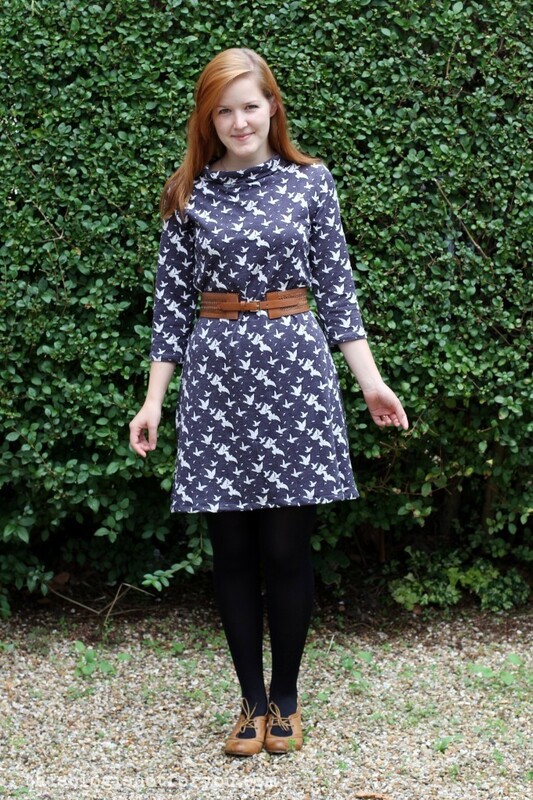 Any autumn *sigh* sewing plans? It’s cute. I like the way you styled it with tan belt and shoes too. Thanks for hooking me up with a new blog to read… I’m now following Dani too. You won’t regret it, Dani’s blog is wonderful! It must be the change of season! 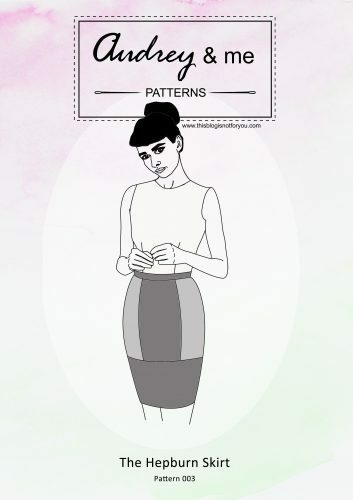 I too have new patterns and fabric and not enough hours in the day! I love the print of your Coco. I didn’t fare too well with the fit of mine. It’s not a shape that worked for me as a dress. I normally love this kind of shape, but it didn’t work for me either. Cinching the waist really helped though, maybe taking it in at the sides would be a good idea. I found that turning it into a Coco top was its only salvation! I think we thought the price was a bit suspicious and the shop a little dodgy. Who could have known that the fabric was that fabulous! It looks great – I love that fabric! I’ve got my first Coco cut out ready to sew at the moment so I hope it turns out well. I know what you mean about having too many ideas at the same time, definitely having that problem at the moment! Thank you! The Coco comes together very quickly, have fun sewing it! I like it styled with brown! I managed to resist buying some of this fabric but now I’m regretting that decision. You look cute! Thanks! I went there a week ago, the fabric is gone now! I love your shoes, I’m looking for similar shoes for my wedding. Where do you get it? I bought them in a charity shop, so I don’t know where they’re from originally. But I often see similar ones in shoe shops, so maybe you’re lucky somewhere! That is really very lovely! Amazing fabric, especially at that price! I think I may have to visit Walthamstow soon! Thank you, Jodie! Yes – go there, it’s awesome! Absolutely beautiful – I love your fabric and the finished item looks super cosy and comfy, perfect for these colder evenings! What a great fabric-pattern combination you’ve got here. 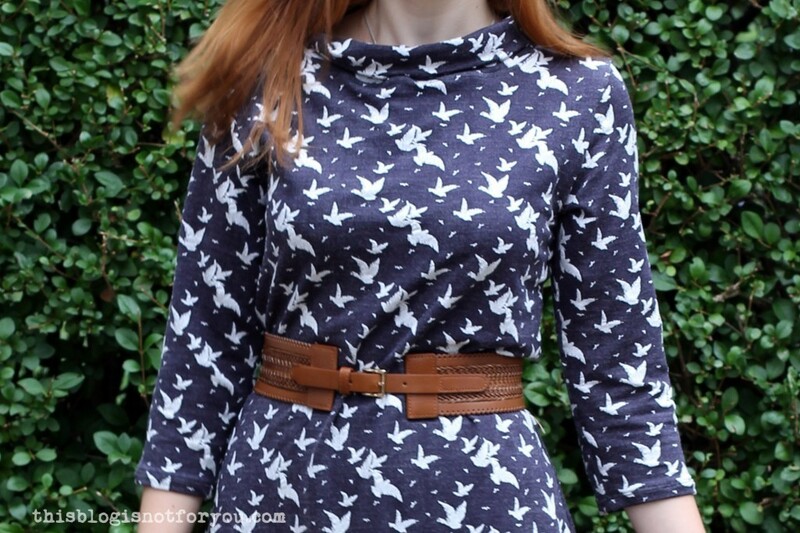 I love this and I think you just convinced me to buy/sew my own Coco dress.